My dad and I started going to Road America more than 20 years ago. After Jason was born, dad and I would speculate every year how old Jason would need to be in order to join us. Turns out the magic number is 7 years and 3 days. There were three generations of Pribyls loving the Spring Vintage Weekend this year. Not only did we get to watch vintage race cars around the big track on Friday and Sunday, Saturday was the first “points” race for Wild Duck Racing. 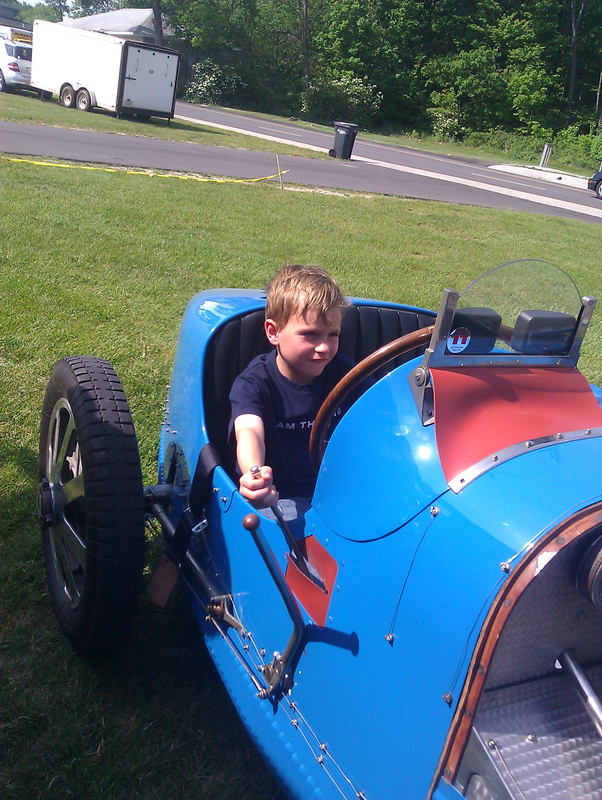 After spending Friday strolling around the track, and Jason trying various vintage race cars on for size, Saturday morning started off very well with practice. 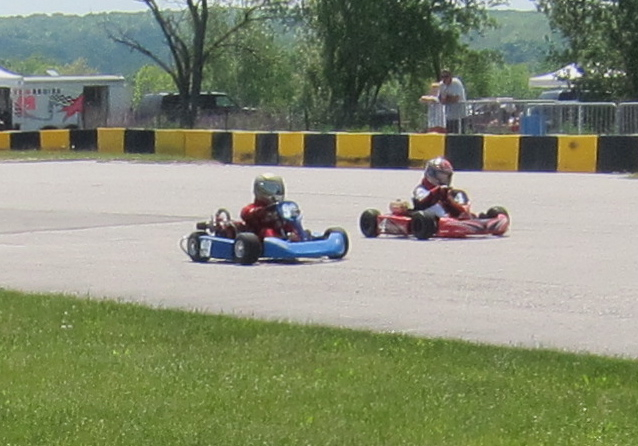 The kids from last week where there and the results were the same, Jason and the kart performed very well. It was a very hot day, but fortunately I had remembered to pack the pop-up awning and lawn chairs so that we could have some shade between races. One of the biggest concerns on a day like that is keeping the driver cool and hydrated. For the most part, Jason was content to flop in his chair and eat popsicles and drink 7UP. If only I could get him out of his suit or at least remove the top so that part of him was cooler! I was really glad to have my dad there to help out, and he was excited to get a pit pass and be on track for the race. 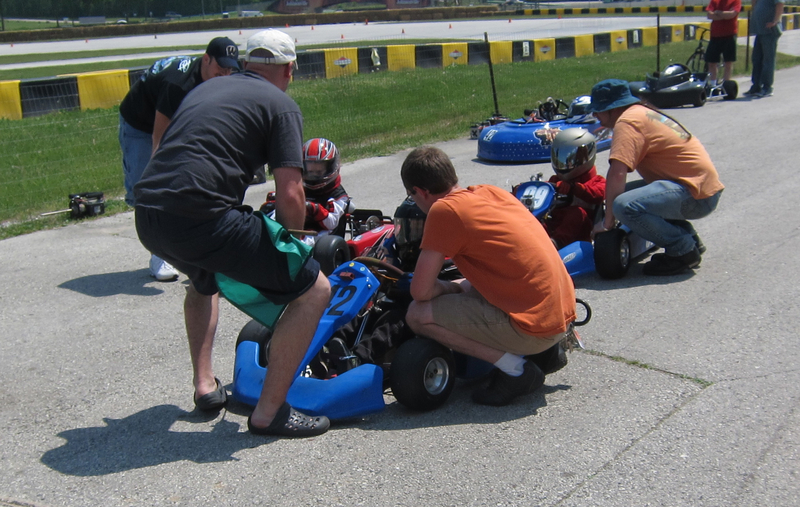 He was very helpful getting the kart prepped and to the grid for racing. He also loved to watch the kids race. At this level of racing every corner and pass it exciting, you never know when a kids is going to figure out some new trick or quickly learn from a mistake. One thing they all learned to do was start in a double file pace lap before the start just like in Nascar and Indy. The results for the day were very disappointing but not for anything Jason did. I am very proud of Jason for knowing that it was OK to be sad and angry, but there was nothing that could have been done. He was feeling much better after a post race ice cream sandwich. After the race I asked him if he would have preferred to sit out the feature race and saved the kart, or raced and tried to win. He said “I wanted to win”. It is hard to argue with that. It is not supposed to be this way. 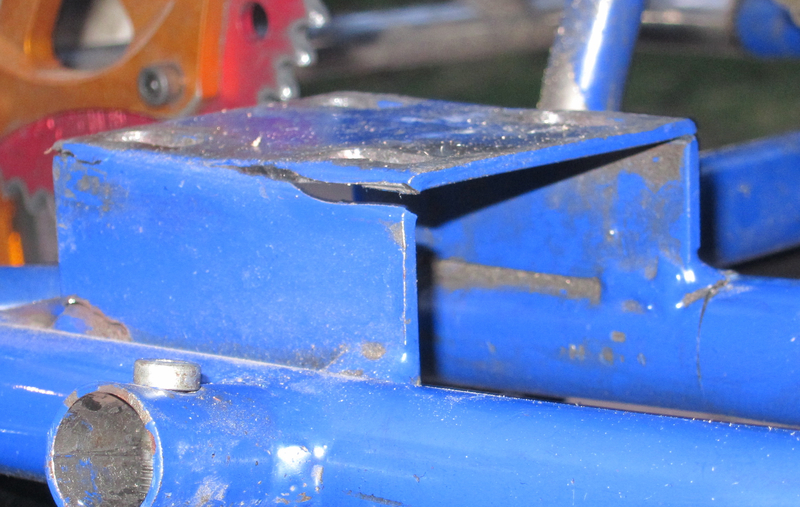 For the next two weeks, the plan is to put the kart back together and get in some track time at CHMS. 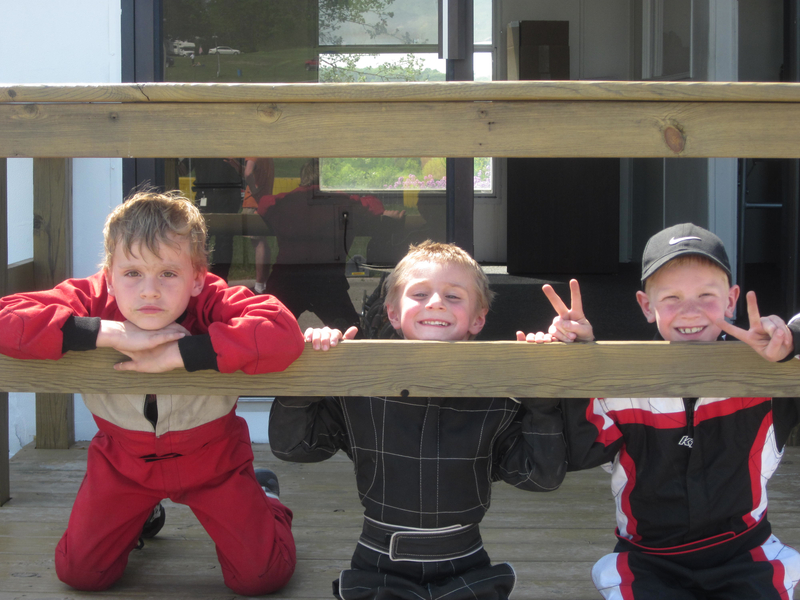 We head off to Badger Karting Club for a race on June 10th, and our next Road America race will be June 16th. This entry was posted in Race Results by ChiefDuck. Bookmark the permalink.